Copper bracelets are a wonderful way to express yourself in a heathful way. This solid copper therapy magnetic bracelet is no exception. 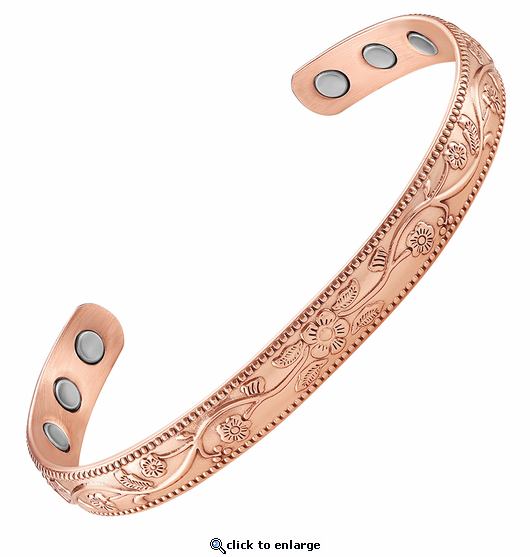 Styled with floral splendor, this shiny copper bracelet has 6 powerful 3000 gauss neodymium rare earth bio north facing magnets and stainless steel magnet caps for added durability. It is made nickel free. This is a unique design and suitable for any occasion.